Looking for something a little different on your St. Patrick’s Day spread? This root vegetable boxty recipe combines four different root vegetables and kale, for something a little bit different than your run of the mill potato pancake. 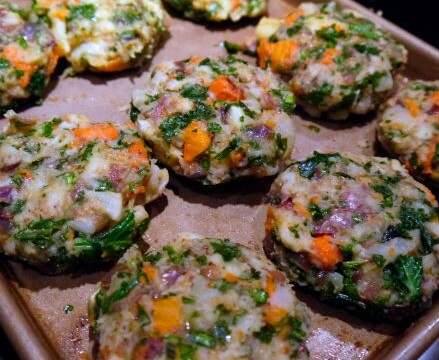 To read more about how to make this dish click this link: making a root vegetable boxty. 2. If using ground flax place in a small bowl with 3 tablespoons of water, mix and set aside. If using egg beat it and set aside. 3. Place the parsnip and carrots on one rimmed sheet tray and the potato and turnips on another. Drizzle with olive oil and a good sprinkling of salt and pepper. Toss and place in the preheated oven. After 10 minutes check, and rotate the trays. Continue to cook for 5-10 minutes more, or until the vegetables are soft and golden. 4. While the vegetables are roasting saute the onion and garlic with a couple of tablespoons of olive oil, seasoning with salt and pepper. Cook for about 5 minutes or until they become golden brown. 5. Add the kale and saute for another 3-5 minutes. If the onions become a little sticky add ¼ cup of water or stock to loosen up the bits. Set aside in a large bowl. 6. When the vegetables are done remove from oven and let them cool for about 5 minutes. With a potato masher crush the vegetables on the baking sheets. Keeping some pieces a little chunky. Scrap into the bowl with the onion-kale mix. 7. With your hands or a flat spoon toss all the ingredients. Pour the flax mix or beaten egg over, parsley and another good sprinkling of salt and pepper. 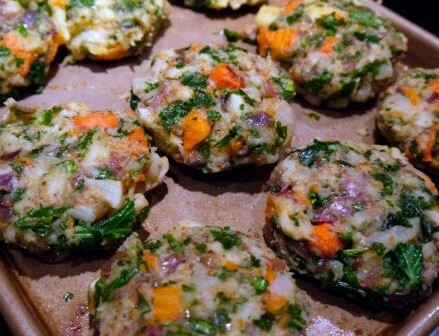 Gently toss to combine all the ingredients and shape into 12 patties and refrigerate overnight. 8. Cook in a non-stick saute pan, using a small amount of butter or oil. Cook for about 3 minutes on each side, or until golden brown.